This coffee will be fresh roasted for you. 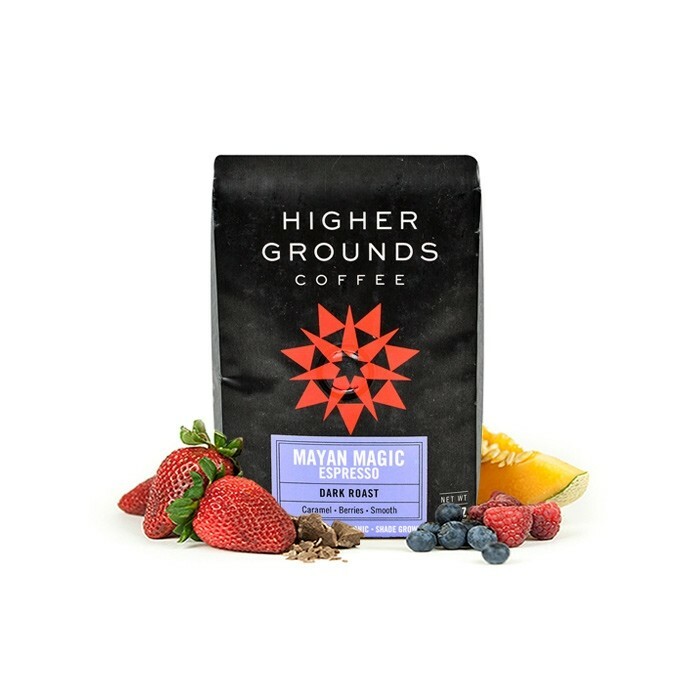 We expect Higher Grounds Coffee will roast and ship this coffee in 1-2 business days depending on their roasting schedule. This is the Mayan Magic Espresso brought to you by Higher Grounds Coffee. Combining Fair Trade and Organic certified beans from Guatemala, Sumatra, and Ethiopia, this blend is designed for perfect espresso at home. This medium dark espresso has a dried tart cherry acidity, cocoa body and a bittersweet chocolate finish. Versatile and delicious. Used it as an espresso, americano, drip and all had different complexity but generally chocolate and a bit of caramel. I really liked the fruity notes but it goes bitter really fast and had a bit of an aftertaste bite. I prefer the coffees with more of a smooth finish. Dark and smooth. Needs finer grind. Very fruit forward. Flavor mellowed out as the beans aged. Chocolatey and fruity. Great roast level. Really solid espresso. The dark cherry notes really come through at the end of every sip, even in a latte. Great espresso. Great flavor, smooth, enjoyable. Not as rich through a Chemex. Not notable enough to desire it again. What I would call close to a 'classic Italian' style espresso... The robust chocolate notes are great. The touch of acidity isn't what I'm personally looking for, but it makes a good, default, familiar espresso. Punches through milk strongly. Outstanding as an espresso, and in pourover. It was okay not very exciting, however for a dark roast it was one of the better ones, not bitter at all. Good, but not great. a nice smooth finish for a latte, but lacked a some punch.